WAILUKU, Hawaii – A resolution will be introduced at the Maui County Council’s Dec. 1 meeting urging the Governor and the State Legislature to mandate the Department of Land and Natural Resources, Division of Conservation and Resources Enforcement, to proactively administer the state statute relating to the preservation of historic properties and native Hawaiian burials, Councilmember Yuki Lei Sugimura announced today. Chapter 6E, Hawaii Revised Statutes, mandates that at any site, other than an actively used cemetery, where human skeletal remains are discovered to be buried and appear to be over fifty years old, the remains and their associated burial goods shall not be moved without recommendation from the respective island Burial Council and approval of the DLNR’s State Historic Preservation Division. The proposed resolution urges timely review and ongoing oversight of archeological inventory surveys, archeological monitoring plans, and archeological preservation plans, including requiring site inspections during land alteration activities to ensure compliance. “It has come to light during the Council’s deliberations on the bill declaring a moratorium on sand mining of central Maui inland sand that there may not be enough focus on enforcement of SHPD recommendations” said Sugimura. All interested residents are encouraged to provide testimony at the council meeting or email written testimony to county.clerk@mauicounty.us. 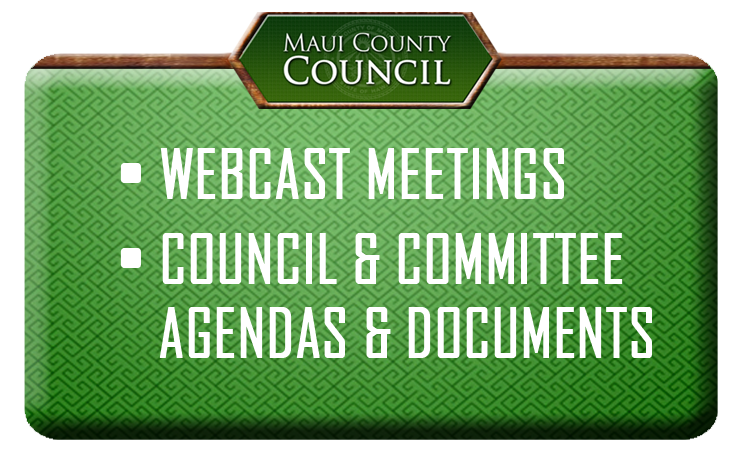 Review the resolution on the council meeting agenda on MauiCounty.us/agendas.